Future blog posts will look closer into each of these aspects. Podiatrists will start with a cast of the foot and some examination findings (both static and dynamic) to design complex foot inserts which change function and better patient's lives. It typically starts with an impression cast of the patient's foot. This image shows 3 left feet, all taken with the same cast technique, showing 3 different foot types. The cast on the right is fairly stable and neutral positioned. The middle cast shows a foot that easily rolls to the outside and needs stabilization for supination. This demonstrates forefoot valgus. The left side cast shows a foot that easily rolls inward producing over pronation. This is called forefoot varus, and there are various corrections for this based on degree of deformity. Most sporting activities require some running. Running can be an excellent return to activity conditioner. After recovering from an injury, the athlete finds great physical and emotional strength from a gradual buildup of running. Injury rehabilitation can involve crutches, cast, surgery, and rest. At some point, when the athlete is back to walking 30 minutes, without pain, and without a limp, a Walk/Run program can be started. The Walk/Run Program that I have used for many years uses a 30 minute time period, based after the more classic 30 minute hard walk test that qualifies the athlete to begin jogging. However, you can start the program based on a 20, 30, 40, or even 50 minute period. It all depends on what you want to get to. I have used the 30 minute program personally twice in my life, once after a back injury, and the other after a knee injury. I found the program difficult since I was out of shape for running, yet safe with its low start and gradual progression. It was not as easy as it looks when you have not run for awhile. Each level should be done 3 times minimum depending on how you feel. Each session should be followed by a rest day to see how you feel. Therefore, completing Level 1 should take a minimum of 6 days. For example, start Walk/Run on Monday, rest Tuesday, 2nd session Wednesday, rest Thursday, 3rd session Friday, rest Saturday, and ready to start Level 2 Sunday as long as Level 1 was fine. Gradually work your way through all the 10 levels. Remember to stay pain free. If you pass to the next level, but your pain starts to come back, rest 3 days, and go back to the level you were comfortable at for 3 more sessions. Again try to get to the next level. 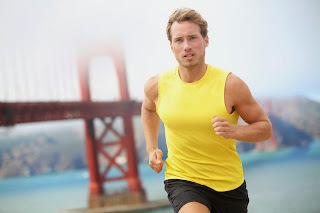 If you again have troubles, stay for 6 sessions at the comfortable level continuing to run every other day. Most patients gradually go through the 10 levels in 2 months (60 days), but some have taken a lot longer to progress. Remember, if you listen to your body, not push through pain, you will make it very safely. The Walk/Run Program works well with even minor injuries where there are questions of when to start running. If you have only been off running for a short time, but you feel anxious about starting running, try this program. In its quickest form, Level one first day, then a rest day, then level 2, then other rest day, and so on. As long as your symptoms are fine, and you do not push through pain, you can get through the 10 levels in 20 days. This is normally better than running 3 miles the first day, having a flare up of symptoms, then stopping running for 2 more weeks. It allows you to test the waters of running more safely. Remember another Golden Rule of Foot: It is better to run 1 second than not at all. Patients ask me all the time if they can start running. If they can walk 30 minutes at a good pace, without pain, and without limping, then they can start running. Any running for most athletes is better than not running. If you can not do the 1 minute for Level 1 Walk/Run, try 10 to 30 seconds running telephone pole to telephone pole. Getting back into running shape can be safe with a Walk/Run program. It may require some individualization, but you will go either at the speed you were meant to, or slightly slower. You will get there!! Good Luck. Podiatrists deal with a lot of nerve pain. Neural Flossing or Gliding is a great technique to be tried to gently move the nerve and prevent scar tissue and swelling to collect around the nerve. Here, this wonderful patient, agreed to have me video her initial exposure to Neural Flossing. The motion should be gentle and smooth. The patient should do 10 leg extensions and 10 leg flexions 3 times per day. For nerve pain in the foot and ankle, neutral spine is important. The patient should extend the hip, knee, and ankle with foot pointing, then immediately flex the ankle, knee, and hip. Comparing the two sides is a great way of seeing the differences, the starting point issues, and the progress made. This patient has a long way to go, but the lesson really showed us a lot of why she is still having problems with lower extremity stability. Your blog has been a WEALTH of knowledge for me this past year... I had a chronic foot injury that went undiagnosed (properly, at least) until March 2013. At that time, my expert ortho surgeon and I decided that my medial sesamoid would be removed, as it was fractured/fragmented. I also needed my bunion repaired and hammertoe (second toe) fused to allow a plantar plate tear to heal. The surgery took place in April 2013, and it is now Nov 2013. I have had MANY ups and downs since then. I've done everything I can to heal the right away--PT, acupuncture, swimming, orthotics, TENS machine, etc. I just had a follow-up visit last week, and I'm just disappointed with my progress... I seem to have "decent" and "bad" cycles of pain, and have been in a fairly bad one for the past few weeks. Prior to that, I thought I was turning a corner and started doing some more "challenging" activities like some light hikes in the woods and testing out some jumping activities, but always with orthotics on and atop thick Pilates mats! Dr Blake's comment: Flareups are very difficult to take during the 2 year rehabilitation course you are on, but you must get through them. Sounds like you are doing everything well. Do your orthotic devices protect the sesamoid area well? Develop a short Immobilization routine you do as soon as a flare strikes----typically removable boot and icing in some form. Remember, flareups are normal, normally not a sign of anything dangerous, and just means you misread what you thought you could do safely. I seem to be an expert at that scenario. Dr Blake's comment: There is no indication of fracture, but the demineralization process from disuse can make the bones more sensitive. Motion of a still healing joint cause cause swelling in that joint. In the big toe joint, the swelling drapes over the sesamoids causing sesamoid pain when the sesamoids are fine. I hope these are part of your problem---fixed by walking, good diet, and icing/contrast bathing. Part of my pain is related to my tendency to produce EXCESSIVE internal scar tissue when I've had a traumatic injury or surgery. When I fractured my right tibial plateau back in 1998, it took years to feel "normal" again, and I've had flare-ups. THIS is worse, though, as it's my forefoot and taking more pressure than even my knee! ;) At any rate, my ortho is very knowledgable about folks who are prone to excessive scarring (it's definitely genetic for me, though my scars LOOK fine externally! ), but there's not much more he can do. My main fears right now are: 1) that I HAVE fractured the other sesamoid and 2) that I'll never feel less pain due to this excessive scarring... I really cannot bear it if I have to wear a CAM boot AGAIN for most of a year to see if yet another fracture will heal. I am praying it's just scarring/bruising/sesamoiditis, b/c at least I can "manage" that somehow... It's hard to know at this point what is "new" and what is just related to my body continuing to "rehab" from the surgery! I know I had rather extensive procedures done, but I guess I had hoped to be in a better place by nearly 8 months out. My doc said it could take my foot up to 2 years to calm down. Any suggestions at this point? Hoping to hear from him today re: ordering me a CT scan! I really don't want to have a totally sesamoid-less foot, but I can't really fathom going through my entire life worrying I've damaged the remaining little bone! ;) Help! Thanks in advance! Dr Blake's comment: First of all, you need to put yourself back in the Immobilization Phase with a Removable Boot with Accommodation, an EvenUp for the other side, and 3 times a day ice pack, until the symptoms of this flare calm down. For flareups, you really should be prepared to do this on a regular basis as soon as possible since it calms things down so much quicker. Scar tissue maturation, when the external and internal scar thins out and gets in the way much less, always occurs from 9 months to a year. This will give you a better, less scarred, big toe joint, but will not even start until late Jan 2014 and end early May. You have over 2 months before that process begins, so I would be kind to your joint between now and May 2014. I would immobilize with flares, work on joint range of motion, work on foot strengthening, weight bear only with protection, increase your cardio (biking, swimming, etc) without jumping!! What has the PT said about your range of motion? How is your foot strength? How is your bone strength? You always get transient demineralization with casts making the other sesamoid and foot prone to stress fractures, so you must be getting your calcium and Vit D3 and know where you are at bone wise. Get the CT scan and let me know what it says. Begin your own self mobilization as the video shows below. Have the PT measure you so we can have a starting point. This is very important if you are worried about internal scarring. Fungal toenails, or onychomycosis, can be unsightly and lead to ingrown toenails due to their increased thickness. In general, I like to stay away from medicine, oral anti-fungals, due to their liver side-effects. I try to stay in an environment-changing treatment arena. It can easily take up to a year to notice a considerable difference with any treatment, so many just leave it alone. For those of you willing to undertake the task of attacking this invader, here are your weapons. What kills fungus? Air, vinegar, bleach, tea tree oil, and dryness are a few of the weapons we can easily combine to kill fungus. Fungus lives in the moist areas of our lives like shower stalls or shoe linings. Fungus lives in an anaerobic environment under the nail made more comfortable with fresh nail polish holding out the air. One problem we have conquering toenail fungus is time. It takes over one year for the toenail to completely grow out twice. There is a general rule that it takes not one, but two of these growth spurts to push the unsightly debri of the killed fungus out from under the nail bed. Some smart person figured that out, but like anything else it is still a general rule with exceptions for longer and shorter time periods. So, we can successfully kill the fungus, but the nail still looks disfigured until all the debri is pushed out from under the toenail. Definitely, this is unfair!! 1) AIR---get as much air under the nails by cutting the nails as short as possible monthly, gently cleaning the debri under the nails as long as there is no bleeding monthly, using an emery board weekly to file the top of the nails as thin as possible, and avoiding toe nail polish as much as possible (quickly remove when not needed). 2) VINEGAR---soak in white vinegar 30 minutes twice weekly using a 1 part warm water to 1 part white vinegar ratio (see another post on using gauze to create vinegar patches for nightly use especially for only 1 or 2 bad nails). 3) BLEACH---disinfect your shower weekly with bleach (for example, Lysol). 4) TEA TREE OIL---apply daily tea tree oil twenty minutes before you go to bed to each affected nail and surrounding soft tissue. It must dry well before getting under the sheets. 5) DRYNESS---air out your shoes weekly that you use regularly by removing the shoe inserts, applying foot powder under and on top of any insert, and rubbing at the top of the toe box where you imagine the toenails rub. 6) PATIENCE---you will need some of this to succeed, and you will!! If you have very thick toenails when you are starting, ask a podiatrist about doing the Carmol 40 Urea Ointment occlusion treatment. This is discussed in another post, but is great at removing the nail without shots, and without bleeding. It is the bleeding that is bad in this process, because the blood is a candy store for the fungus. Many podiatrists recommend seeing them once every 1 or 2 months during the initial 6 months to thin the nails with their electrical grinders. It sounds gross, but it should not hurt at all. In fact, this whole process should be painless. If you decide to use oral medicine, use pulsed Lamisil. It is the safest that I know where you take for only 7 days each month for 6 months. You still have to do the topical treatments as mentioned above. At present, the pulsed Lamisil does not need liver testing as part of the treatment, but your prescribing doctor may feel safer doing that. Golden Rule of Foot: Always error on the side of caution. With the advent of Laser toe nail cleansing treatment, I would normally recommend this over oral medicines. If helps clean out the fungus debri faster than anything, but it is not a cure. 50% of patients think they were helped by it. 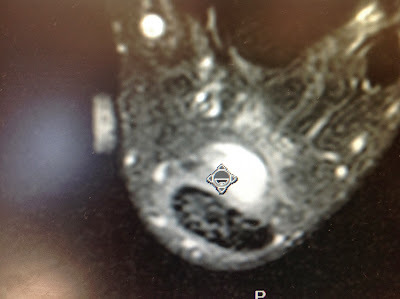 This MRI image of the ball of the foot highlights swelling under the first metatarsal produced by a joint sprain but causing palpable soreness on the sesamoid bones. The xrays showed a possible fracture of the tibial sesamoid and surgery was being considered. The MRI clearly shows that both sesamoids are fine (to the left and right of the arrow under the first metatarsal head). This patient actually sprained the 3rd metatarsal phalangeal joint (see the reactive swelling or whiteness) and was favoring that area placing weight abnormally on the big toe joint. I am so grateful to your writing this wonderful blog. Thank you! For about 12 month I have severe, debilitating heel pain, very similar to plantar fasciitis. I do not have any first step pain and my pain gets progressively worse over the course of the day. Dr Blake's comment: Without the am soreness, we are probably not dealing with plantar fasciitis. In addition, I experience a burning pain that feels like nerve pain. Dr Blake's comment: Here is my original video on the differential of heel pain. See if it makes sense that you have plantar fasciitis or another problem. The hardest to diagnosis is nerve entrapment. I am able to only stand or walk for about 3-5 minutes. The inside of my heel is tender if pressed and my heel is painful upon percussion. Dr Blake's comment: This sounds like possible calcaneal (heel) stress fracture/bone reaction. This diagnosis is only made by MRI or bone scan. Over the past few months, we have ruled out plantar fasciitis, as well as nerve root compression originating from L5/ S1. As a treatment I had received a steroid injection into the plantar fascia, as well as an epidural steroid injection. These treatments have not produced any results. I try to stay very active: I do yoga, Pilates, I walk on a de-weighed treadmill, and I work out on a stationary bike in a tireless attempt to get better. I so hope to be able to take a walk with my children again. Dr Blake's comment: Even though your workup sounds good, why has there not been an MRI or bone scan? You can have nerve pain from the swelling produced from a calcaneal fracture. So get one of those 2 scans. Recently, someone suggested to me that I had Baxter’s neuritis. From the literature that I was able to find, this diagnosis seems to fit my symptoms exactly. I do feel a lot of sensation and pain along the course of the first branch of the lateral plantar nerve. What would be the treatment for this? I am wondering if I should immobilize my foot instead of stretching it and mobilizing it. I would be most grateful for a reply. If you are suffering from tarsal tunnel syndrome, you really want an MRI like this. This MRI shows inflammation of all three tendons that run within the tarsal tunnel on the medial side of the ankle. This inflammation places pressure on the posterior tibial nerve that runs within the tunnel causing nerve symptoms of pain, numbness, electric shocks, etc. If you can reduce the inflammation, create a pain free environment, and calm the nerve sensitivity down, the symptoms should get better. Artificial Leg: This will bring a smile to your face!!! I finally broke down and saw a pedorthist last night and we're starting with a simple adhesive foam insert located down from the tailor's bunion and under the 5th metatarsal. I went running this morning and within a 1/2 mile I was fairly used to the lump in my shoe. I went about 3 miles with hardly any pain. What we discovered as well was I was buying corrective running shoes for my pronation. I switched back to an older less structural shoe and let my pronation go for the run and felt better as well. While I'm trying to relieve the bunionette he recommended I stay way away from shoes that force me to put pressure back towards my 5th metatarsal. Once the pain pain is lessened then I can start back with the corrective shoes. I found your blog and need some advice if you have a minute. I have pretty bad lumbar back problems. MRI has shown lots of problems from L3 down to S1. I was referred to a pain doc for 3 rounds of steroid shots. She took new pictures and said it was time for me to see a surgeon. At the same time I have numbness in my feet. Bad in the right. Swelling/pain in ankle, etc. Went to foot doc and was diagnosed with tarsal tunnel and neuroma. Have this in both feet, bad in right, left is manageable. He said my shoes were to narrow causing the neuroma and my high arches were falling causing the tarsal tunnel. Basically, I'm a mess and in pain all the time. Lower back and ankles/feet. Hard to stand for very long. I was googling and found "Double Crush" which links the lower back problems and the tarsal tunnel problems. I need advice because I don't know how to proceed. I've tried everything, shoes, expensive orthotics, compression socks, stretching, exercises, chiropractic, massage, and others. I was prescribed shoes, orthotics, compression socks by foot doc. I was prescribed drugs (They want me to take Lyrica) by the neuro sergeon. I'm frustrated and frightened because I'm just turning 50 and I concerned this is only getting worse. I don't know if I should see another foot doc or another back doc or what to do. I need my foot doc to talk to my back doc and discuss this problem together because my reading indicates they are related. I'm also confused on the orthotics because some of my research shows, yes do them, other reading indicates they may be causing some of the problem and I need to go natural. I believe there is a connection and my alignment from my feet up to my back is out of wack and I don't know were to turn. Thank you so very much for your email. Lower Back irritation to the nerves that go to the foot are unfortunately very common. I am a biomechanics expert. I need to see if I am dealing with a musculo-skeletal problem, or a neurological one, since the treatments may vary at times. You want to try to avoid foot surgery, if suggested for neuroma or tarsal tunnel, until the low back component has been worked on considerably. But, you still need to treat the foot locally. Golden Rule of Foot: Treat the Low Back Nerve Component First to see what the Role in the Foot Pain. You are so right to want a team approach. Typically, this is a physiatrist, who can work with the medicine/epidural side, but knows what the podiatrist is doing, and what the neurosurgeon has to offer. You are in a nervous system overload right now. You should maximize support to the foot and low back (orthotics, foot strengthening/taping, core strengthening, back braces), and ways to minimize nervous irritability (oral meds, topical meds, warm soaks, neural flossing,etc.). I never recommend avoiding medications in this scenario, since you have to get the nervous system calmed down, and it can take a long while, getting the medications right. Definitely, the role of orthotic devices to stabilize your lower extremity, and lifts if you have a short leg, are a no-brainer to me. Find out who makes the best orthotics in your area. Have your doc prescribe a Standing AP Pelvic Xray to document the leg length difference standing (I have some posts in my blog on this). Treatment of a short leg is Back Pain 101 to me. Most definitely recommend surgery for the back if the nerve injury is causing weakness in your legs, but waiting a month or two to get orthotics that make your feet function symmetrically and lifts for any short leg make help considerably. I have been dealing with sharp/shooting pain and tingling in my foot since January (I was originally diagnosed and treated for stress reactions in the metatarsals, then sesamoiditis, and for the past few months, tarsal tunnel.) The tarsal tunnel syndrome was confirmed with a NCV/EMG test, however, despite 3 months of physical therapy, surgical shoe bracing, and a 200mg daily dose of Lyrica, the pain, tingling, and numbness in my foot and ankle have grown worse. I had a recent MRI (I attached some images.). Do you see anything abnormal which could be contributing to the problem? I am about to get a second opinion for surgery. Do you have any other suggestions? I am so sorry about your situation. Hopefully, you can get this resolved without surgery. From what I gather from looking at your MRIs and reports, you injured the tibial sesamoid under the big toe joint 10 months plus ago. This caused swelling in the big toe joint, and this still exists to be worked on, since it can continue to be a trigger for nerve pain. I think the big toe joint injury still has a little healing to go, and you must daily try to protect with dancer's pads/orthotics, reduce the inflammation, and allow weight bearing since you are showing signs of some demineralization in that area. Make sure your Calcium and Vit D3 are good--typically 1500 mg calcium and 1000 units Vit D3 daily. The nerve pain can be from many sources and normally is a combination of things. The tendon that goes under the big toe joint was still inflamed back in the ankle and probably has caused pressure on the tarsal tunnel nerves. Any limping that causes you to supinate (walk on the outside of your foot) can also be an irritant to the tarsal tunnel. You have some low back dysfunction, even if mild, but can still cause some hypersensitivity to the nervous system. L5 nerve root affects many nerves under the middle of your foot. The removable boot, even if you use an EvenUp (hopefully you did!!) can tweak the low back or hyper-extend the knee causing neural tension. All this being said, you have many reasons, non-serious that could have (and still are) stirred up your nervous system. You have had all the right tests, but now you need to find someone to calm down your nervous system. Addressing the possible triggers are important, so decreasing inflammation in the big toe joint makes sense, making sure you are not walking to the outside of your foot, making sure you are not hyper-extending your knee, making sure your gait is centered (not dominant to one side which is always bad from the spine), and perfecting all the ways to calm down the nervous hypersensitivity. I have many posts on my blog that can help you, but you need someone in pain management that can help with Rxs,etc. Medicine seems good at evaluating and treating damaged nerves, not hypersensitive nerves. To help you get started, work daily icing and contrast bathing for the big toe joint. Weight bear to tolerance if possible gradually improving duration. See a physical therapist to find out how to protect the sciatic nerve, and keep your spine neutral when you do activities, and outline a plan to increase activities. You might need an epidural injection to calm down the nervous system, and if you have any sympathetic signs (skin discoloration, changes in sweating, etc), also need a sympathetic block. I had to have both after a back injury, but they were done at the same time. Treatment to the foot/ankle has to be gentle due to the nerve hypersensitivity without injections (unless you are calmed down). Deep massage should also be avoided. You need to be doing non painful strengthening of your foot, and typically swimming or stationary bike are used for cardio (this is where the physical therapist can help). Hypersensitive nerves love gentle motion, heat, gentle massage. Learn what is neural flossing so that someone can show you if appropriate. Easy to do multiple times a day. In terms of medicine, stay on 200 mg Lyrica right now, and add Cymbalta or Elavil at bedtime. These changes are common to begin to get ahead of the symptoms and necessary since you are increasing in symptoms. Have a RX for Lidoderm patches and a compounding medication for nerve pain (you could start using the OTC Neuro-Eze and find where you can massage without increasing pain). I have patients who can not massage due to the pain, but a compounding spray is given which helps. There are 2 types of physical therapy--musculo-skeletal and neurological. You need neuro based physical therapy right now. There is a daily, sometimes hourly, distinction to be learned about Honoring your Pain vs Working Through your Pain. It is an important skill to learn.